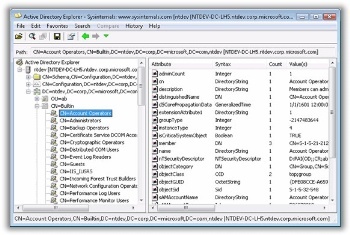 Active Directory Explorer is tool that allows you to browse through your Active Directory data. What does this mean? This means that people that write tools for Active Directory can now read the raw data and see fields and the data that is stored in those fields. This allows you to access things that you didn’t know existed through LDAP queries. Don’t know what Active Directory is? Easiest way of thinking about it is that it’s Microsoft’s way of providing authorization of users to computers through a network. Active Directory itself is a database that basically allows network administrators to derive policies against groups and individuals and allow pushing of software through a central database.